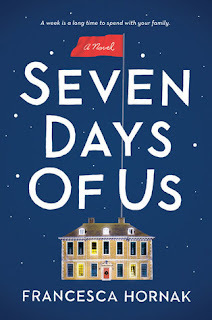 Seven Days of Us by Francesca Hornak is a dysfunctional family drama, so-so for me, but recommended for the right reader. The Birch family is going to spend Christmas together - in quarantine. Emma and Andrew Birch will be spending seven days at Weyfield Hall, their country estate, with their two daughters. Their oldest daughter, Olivia, is a doctor who is returning from treating an epidemic in Liberia, the Haag virus. She has to stay in quarantine for a week, and so must her family if she is with them. Olivia views her family as rather superficial and foolish. Youngest daughter Phoebe is shallow, self-centered, and focused on her upcoming wedding. Andrew, a restaurant reviewer, has received an email from an illegitimate son he knew nothing about, and Emma is keeping an even bigger secret from them in hopes of having a wonderful family Christmas. 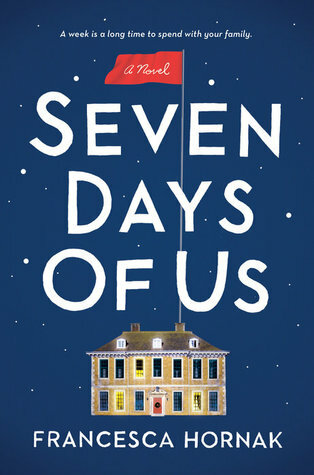 Each chapter in Seven Days of Us is written from a different character's point of view. They are short, quick chapters. This does help move a very s-l-o-w start along any quicker, but at least you get to read about what another character is thinking/doing. Everyone has a secret, but the secrets are all out and running rampant for the reader. The novel then sets up a series of unbelievable coincidences that all collide and help expose all the secrets. Did I mention that it starts out very s-l-o-w. Extremely s-l-o-w. Add to this the host of unlikable characters and it was difficult for me to make myself continue to read because it all seemed so pointless to spend that much time with characters that I didn't remotely care about. I also had a very difficult time with the big set-up, that the family was all to be under quarantine. A quarantine for a doctor returning from working in an area with an epidemic (called the Haag virus here, think Ebola or Marburg virus for comparison purposes) does not consist of being locked up with your family for Christmas and relying on them to stay isolated and others to read the notice and stay away. Period. And the family members were all ignoring the seriousness of that premise anyway - going out, inviting people in. They sort of proved themselves to be foolish, again and again. They are, however, more caricatures than real characters, so it just comes off as farcical.